Home / Say “Hallo!” to our new bilingual customer support representatives! While the bulk of our customers and the majority of our operation are based in the United States, QuiBids easily qualifies as an international business. We’re proud to have cultivated dedicated customer followings outside our own borders; first in Canada and then Australia, on our way to our newly opened auctions in the United Kingdom. We’re also currently working on expanding into another primarily English-speaking market, New Zealand! But we’re not stopping there. 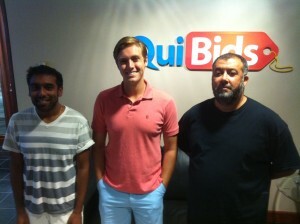 QuiBids intends to be operating in a handful of European countries by the end of the year, France, Germany, and Spain among them. Now, it would’ve been pretty silly to just set auctions up for French-, German-, and Spanish-speaking customers without hiring somebody to show them how to use the site, so we’ve also brought in a small crew of bilingual customer support representatives here at our Oklahoma City offices so that they can answer your questions and enrich your QuiBids experience no matter what language you speak! Obviously it’s a little bit intimidating to talk to people who are intelligent enough to speak more than one language, but we gathered up the courage to have a chat with our new reps and find out just how they came to learn how to speak their respective languages…or English, as was the case for Mohamed, who actually speaks three different languages, and maybe even more than that, for all we know. You can read what they have to say (in English) below. So how did you come to learn how to speak your second languages? Anish: During the Spring of 2010 I spent a semester studying abroad at the University of Picardie Jules-Verne in Amiens, France. This experience allowed me to gain fluency in the French language and immerse myself in the native culture for six months while enjoying life and living nights in Paris right out of the movies. 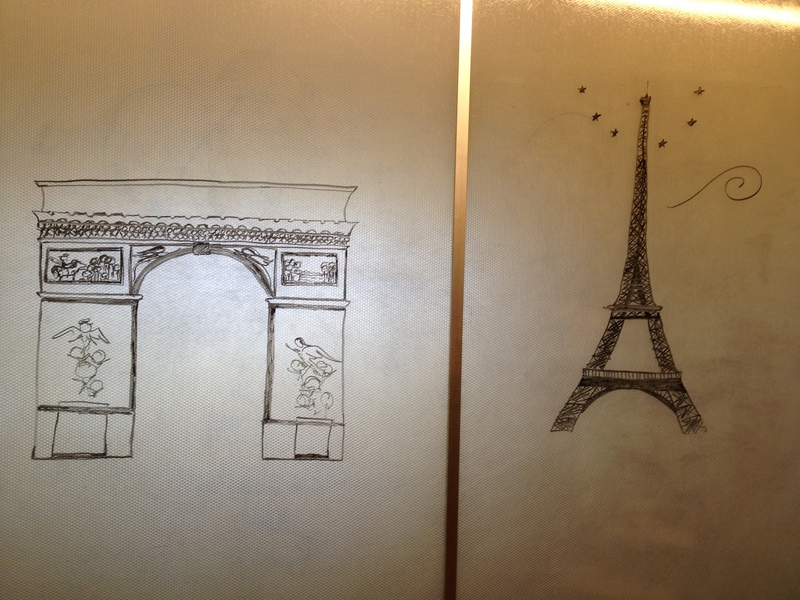 Some art inside the international office, drawn by our very own French-speaking Customer Support staffer Anish! Garrett: German was my minor in college, and I’ve always had an interest in the language because of German cars. Mohamed: I was born in Casablanca, Morocco. French is almost a native language. In fact all my education was conducted in French except for a few classes in Arabic. English is my secondary language. Which country speaks your respective language have you wanted to visit but haven’t yet? Anish: As much as France is close to me, I’ve always wanted to go explore Canada, especially the big cities like Montreal and Toronto. I have heard that Canada is a second Europe overseas, and I have liked everything I’ve heard about their culture and people so far. I love hearing from Canadian customers especially when they call in with a question. Garrett: German is spoken primarily in Germany, Austria and Switzerland. I want to visit all of them, and really have a chance to soak in the culture, food, sports culture, and language. Driving on the Autobahn in a Porsche is also one of my lifetime goals. Mohamed: I personally visited most countries that do speak my language(s). How does helping French/German/Spanish-speaking QuiBids customers differ from helping English-speaking ones? Anish: When speaking with someone who speaks another language, you are not only challenged to help them with their issue, but you also challenge yourself in many ways. Adjusting to different vocabulary between Canadian and French dialects is easier said than done, but it’s rewarding at the same time. You improve your ability in a second language by adapting to words and expressions you’ve never come across, even on a phone call. Garrett: The different nationalities have completely different standards of customer service, and completely different standards of respectful dialogue, so dealing with these customers is going to be a new challenge for all of us. Got a favorite particular plate of French/German/Spanish cuisine? Anish: France is the world’s queen of cuisine, and I was immediately attracted to the desserts at the bakeries, called pâtisseries, from the get-go. From a street-side café with crêpes and crême brûlée to the infamous macarons of Ladurée in Paris, les desserts françaises are out of this world and unforgettable. Garrett: My favorite German food is anything consisting of meat, potatoes, and sauerkraut… so I like all German food. Mohamed: I like plat aux escargot (snails), but it has been a while since I did not have one. I went to Paris in 2005 but did not have the chance to enjoy one. QuiBids Store is now available in Canada!